In a cryogenic fuel rocket, at what pressure is the fuel injected into the engine? The pressure in the Space Shuttle's main engines must be very high to get the vehicle off the ground (with the SRB assist, of course). With such high pressures inside the engine, how do you inject fuel into the engine? I understand that the fuel is passed around the engine so that it cools the nozzle, so that the exhaust doesn't melt it, then into the engine. However I always assumed that the pressure of the fuel going into the engine must be higher than the pressure the exhaust gases exert. If so, how does the Shuttle pump such high pressure fuel into the engines? Thrust is generated by flowing high pressure gas into a lower pressure environment. This flow is supersonic, so what goes on downstream of the throat (top of the the nozzle) cannot be sensed by what is going on in the combustion chamber (sound is just a pressure wave). The nozzle is supersonic, the combustion chamber is subsonic. The nozzle expands the gas to create the high stagnation pressure required -- mostly by increasing the velocity of the gas. Note that stagnation pressure (the value you are thinking of) is not just static pressure -- it also includes a velocity component. No pressure information is transmitted back from the nozzle exit to the combustion chamber due to the supersonic flow in the nozzle. A large portion of the nozzle's exit pressure (stagnation pressure) is from the velocity of the gases -- velocity created by expanding the supersonic gas flow. Fuel and oxidizer is pressurized however to some degree by turbopumps to insure positive delivery into the combustion chamber. Hope this helps. Propulsion is a very complicated field. Update: The main combustion chamber pressure on the SSMEs at full power is approximately 3,008 pounds per square inch. The SSME is a staged-combustion rocket engine, which means that some small fraction of the propellant flow into the main combustion chamber is first diverted into a small pre-burner (two actually). These preburners combust (relatively) small amounts of fuel and oxidizer to produce hot exhaust gas which is expanded through a turbine, which is mechanically connected to a pump (hence turbopump), which is used to supply high-pressure fuel and oxidizer to the main combustion chamber. 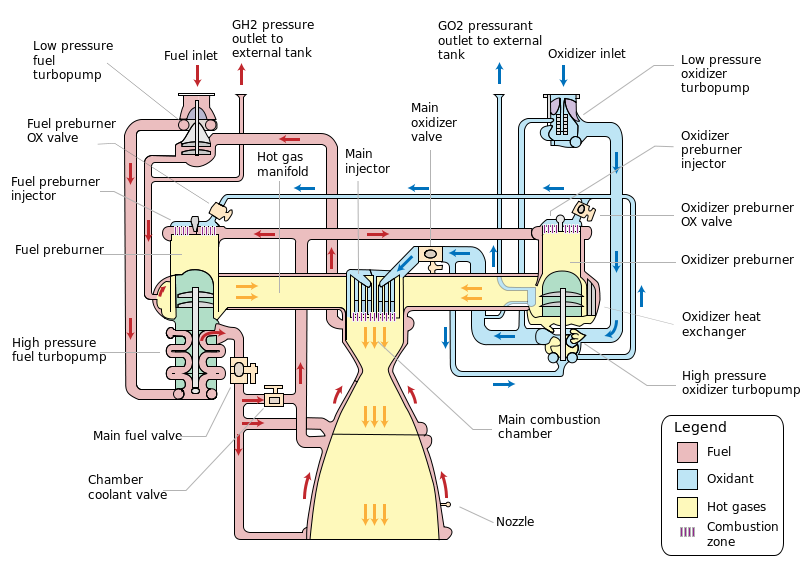 The actual engine is significantly more complicated than this (even in a simplified schematic), but this is the basic premise of any turbopump-fed engine: hot gas turns a turbopump that pumps up the main propellant supply and injects it into the combustion chamber. The SSME has lots of other little details, like high and low pressure pumps, and feeding the combustion gasses back into the main chamber—rather than venting them overboard as the RS-68 does. But the bottom line is that the OP is right. The pressure is very high in the combustion chamber, you inject propellant into the combustion chamber by having an even higher pressure at the outlet of the turbopumps. Store in the tanks at lower pressure, pump up with the turbos, then ride the pressure gradient all the way to the bright blue light at the end of the nozzle. If you want a better understanding of why the propellant needs to be at high pressure in the first place. Do solid propellant engine needs optimum temperature? How was fuel crossfeed achieved, between the main tank and the Shuttle? Is it possible to estimate the nozzle characteristics of the Rocketdyne HG3 engine? Where does the thrust act in a rocket engine and how is it transferred to rocket structure? How would the rocket differ in a higher atmospheric or ambient pressure?